It's really easy to get the correct size for your blinds (you can use our measuring guides and videos) but everyone makes mistakes sometimes. 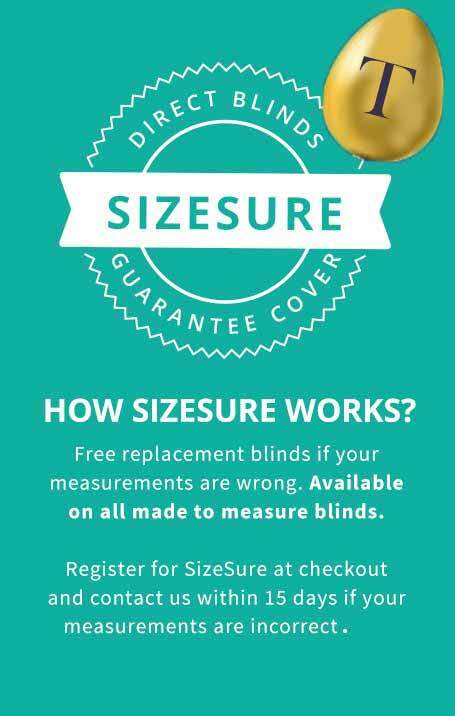 So, in the unlikely event your blinds don't fit when you get them, you are now covered with our free replacement blind offer on our made to measure blinds service - SizeSure. All you need to do is inform us of your new size requirements (within 15 days of product receipt) and we'll send your replacement. Terms and conditions apply. This offer does not include shutters, curtains and ready made products. Direct Blinds reserve right to charge an extra fee for larger replacement blinds. The standard delivery charges will apply. See here for general SizeSure information. For our comprehensive SizeSure T&Cs please click here.